Research documentation is a critical aspect of running a clinical trial. Key patient information such as informed consent, adverse events (AEs), concomitant medications, and medical and surgical histories are collected and used to determine patient safety and efficacy as the trial proceeds. Ultimately, the sponsor may make decisions—ranging from modifying the dose of the investigational drug to closing the study due to AEs—based on the data collected. Despite how critical this information is to a clinical trial, research documentation remains largely a cumbersome, paper-based process. The collection of paper research documentation, separate from the patient’s medical chart, is often referred to as a “shadow chart”; this results in source documentation stored outside the patient’s electronic health record (EHR). This information must be carefully tracked and transferred among all stakeholders who enter, edit, or sign off on any of these documents. One piece of documentation kept in this shadow chart is the AE log. AEs must be documented at every patient interaction and entered using standard terminology. The paper-based AE documentation (Figure 1) process is cumbersome in many aspects. 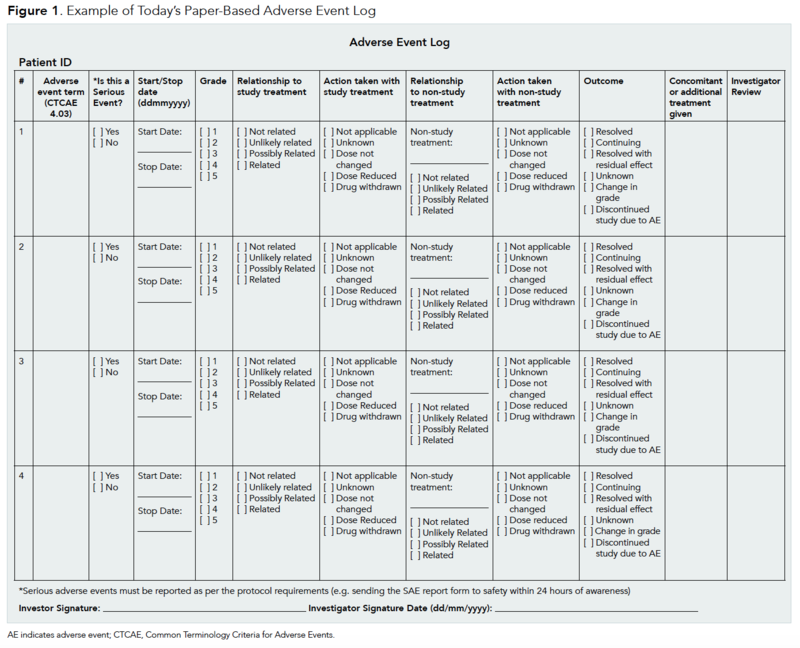 For decades, the paper log has been the accepted tool for clinical research staff, data coordinators, and primary investigators/subinvestigators (PIs/SubIs) for recording AEs in a prospective clinical trials. Each of those individuals is required to enter, edit, review, or sign off on every detail of log information. The clinical research coordinators (CRCs) first document the AEs in the paper log. Next, the PI/SubI reviews, completes, and signs off on these events before the data coordinator can use the written information to painstakingly type the exact data into the electronic data capture (EDC) system. However, each staff member physically sits in a different place, forcing a “hot potato” hand-off of the log throughout the day. Additionally, AEs must be reviewed at every patient interaction (each visit, phone call, etc). This results in a risk that the CRC is interacting with the patient at the same time the PI/SubI is reviewing the log. Therefore, the CRC may not have the log on hand to immediately document the AE reported by the patient. 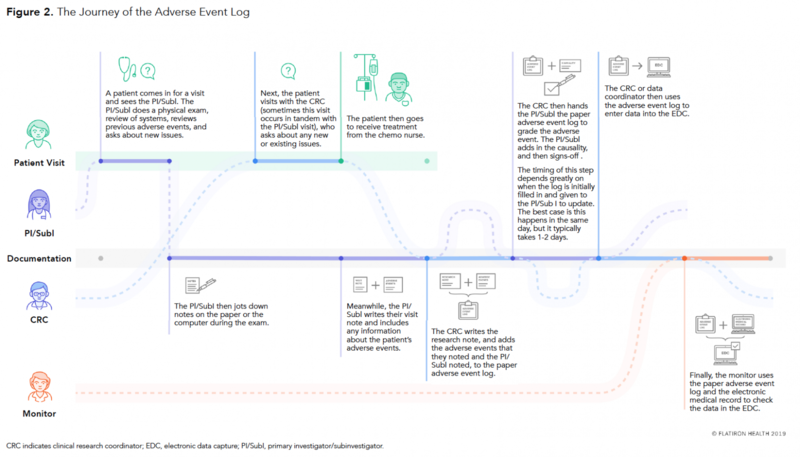 Based on many conversations between Flatiron Health staff and those in clinical practices, it is clear that this cumbersome, multistep process means that the log may be in the wrong place at the wrong time. CTCAE term they use matches the CTCAE version of the trial. Finally, these logs quickly become crowded and messy due to the fact that multiple contributors write in and edit each log. Again, because of the manual and handwritten process, research team members and/or monitors often express frustration with the trouble of interpreting the data. This leads to questions that the research team spends time fielding, but these questions could have been avoided if the data had been more legible or easier to follow. Over the years, we’ve heard from the Flatiron Health network of community-based practices that for the reasons stated, paper-based research documentation—and specifically AE documentation—is a critical pain point. In 2017, we kicked off a brainstorming session with some of the 350-plus community leaders at our annual provider conference to explore different solutions. From these early conversations, it became clear that digitizing the AE workflow in the EHR could be a way to alleviate some inefficiencies of the paper-based workflow. As the idea of electronic AE capture began to take shape, we conducted on-site user research with 10 selected practices. These sites represented a range of research practices, differing in size as well as phase (ie, early- through late-phase trial sites). We then partnered closely with 5 of these sites, which became our beta partners. A beta partner is a practice that tests our initial product versions and works closely with us throughout the product development process to ensure that our solutions are intuitive and effective for practices across the provider network. we’ve spent more than 40 hours to date on the phone and in person (including several on-site visits), improving the workflow with our development partners. Across user research visits, we observed key trends in the core process for AE documentation (with slight variability) across sites (Figure 2).The research team at a site can find out about a patient’s AE in several different ways: The patient may come to the practice for treatment and/or a physician visit and tell the physician, CRC, or chemo nurse; a patient’s lab values may come back abnormal; the patient may call the practice to say they are experiencing an issue; or the patient is hospitalized, which the practice learns from the patient, caregiver or hospital. A patient comes in for a visit and sees the PI/SubI. A PI/SubI does a physical exam and review of systems, reviews previous AEs, and asks about new issues. The PI/SubI then jots down notes on paper or a computer during the exam. Next, the patient visits with the CRC (sometimes this visit occurs in tandem with the PI/SubI visit), who asks about any new or existing issues. The patient then receives treatment from the chemotherapy nurse. the EHR to check the data in the EDC. PI/SubIs may want to see only information that requires action from them. For instance, “I don’t want to see the old or closed-out AEs,” said Ted Arrowsmith, MD, a PI at Tennessee Oncology, Chattanooga. Previously in the paper logs, there could be several pages of resolved AEs that the PI/SubI would need to flip through before reaching AEs that required action from them. However, monitors would need to see the comprehensive change history of who changed what, and when. Integrate with other physician workflows, yet not affect the workflows of physicians who are not involved in research. Provide easy access to or the integration of CTCAE names and grades, such as with a smart-search or auto-suggest function. Switch easily between CTCAE versions that differ based on the trial. Allow for modifying previously entered data while tracking a comprehensive change history. In April 2018, we presented the first version of our feature to our beta partner practices. During this phase of feature development, we continued to learn more about the specific use cases for electronic AE documentation, and we gained more specific feedback about changes to our product. For example, some practices suggested specific terminology changes. Another practice pointed out the importance of specifically calling out AEs that are dose-limiting toxicities (DLTs) for early-phase trials. Additionally, the paper log had other flexibilities that we hadn’t accounted for in the initial version of the electronic log, such as the ability to add an AE that was not listed as a standard CTCAE term. Gerald Falchook, MD, director, Sarah Cannon Research Institute at HealthONE, Denver, expressed that he “wouldn’t want to be boxed in” by the initial version of the digitized workflow.